Consumers are eagerly awaiting the next step in broadband technology: 5G. With an explosion of small cell and fiber deployment, internet is the fastest it’s been to date. Users can download and stream data better than ever before. We’ve been promised a new reality: self-driving cars, virtual reality, delivery drones, and comprehensive home automation. The Internet of Things is creating a new tech landscape for the world, and its backbone is fiber. 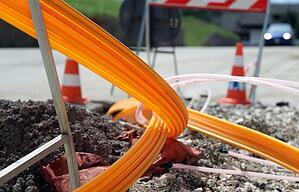 Broadband providers are scurrying to lay fiber optic cable as quickly as possible. Small cell and DAS are being deployed rapidly to boost signals in metro areas, at large event venues and in other challenging environments, often with fiber backhaul. So, what’s delaying fiber throughout the country? Only 25 percent of households have the option of Fiber to the Home (FTTH) and rural areas in the United States are still underserved or not served at all. We have compiled a short-list of three reasons why deployment is not speeding up. As Forbes explains, a fiber cable cannot simply be stretched, for example, from New York to San Francisco. Every 40 to 60 miles, the connection must be re-amplified at an in-line amplification shelter, which can be expensive to build and maintain. And laying cable means acquiring ROW (right-of-way), a costly and time-consuming process. The United States is big—and distance is one major reason that small rural areas do not have direct access to fiber. For cities and towns outside of major metropolitan areas, one setback with fiber deployment is expense and the ROI for providers. With fewer people per capita in such areas, broadband providers are skeptical that the expense of extending fiber the extra miles will be justified. According to U.S. Department of Transportation data, the average cost of deploying fiber broadband is $27,000 per mile, which means some places cost a lot more than that. An economic consulting firm recently predicted it would cost $61 billion to deploy fiber broadband in all of the country’s unserved rural areas. Environmental obstacles are another reason for delays in maximum broadband deployment. Rural areas tend to have more varied geography than heavily developed urban areas. A wide range of composition awaits the installer under the surface, which most often includes rock. Plans have not been effectively drafted for rural areas that may be mountainous or have frequently dangerous weather. Further, buying or contracting large machines to remove boulders or bury cable under water may be above the budget line for many carriers. US Telecom’s CEO Jonathan Spalter says in a news report that his company, among others, has made huge investments in the deployment of the digital economy. Corporations like his are dedicated to reaching rural areas so they are not left behind. However, they cannot complete that mission without subsidies, Spalter says. Last year, the Federal Communications Commission committed to provide $2 billion in subsidies over the next decade to help extend broadband to unserved rural areas, where about 35 percent of residents have no broadband at all. Many groups in the United States are conducting campaigns and advocacy platforms, urging the government to act faster, especially for American education and school systems. With the Dig Once Policy, infrastructure is installed and providers have adequate access to the ROW during roadway work. It lowers deployment expense by sharing costs of digging between road construction companies and broadband companies. Several states are opting into the policy, including Arizona, Minnesota, and Utah. More cities and communities are realizing that fast internet means a stronger local economy. The absence of fiber broadband is a big handicap for recruiters luring big business into their city. Business executives know that top talent will expect access to modern bandwidth. Agreements between public entities and private companies, like major employers and large real estate developers, have become a common source of new FTTH and Fiber to the Building (FTTB) projects. Developers have realized that fast internet is an attractive incentive to offer potential subdivision and apartment residents, as well as small business tenants. Improvements in fiber flexibility have also made it easier to install in existing apartment buildings. On the other hand, community and business leaders are becoming aware that failure to ensure fast internet service is a good way to get left behind. Rural utility cooperatives were created to speed the extension of electric and telephone services to remote areas that large utility companies did not serve. Many of those same co-ops are now taking action to bring fiber broadband to their rural customers. For example, Montana and North Dakota have high FTTH access because of their supportive co-ops. The powerful economic incentives for extending fiber is beginning to spark creativity and cooperation among providers, governments, developers, businesses, and grassroots organizations. Once established, fiber networks will provide years of reliable service at minimal costs. However, because of the many actions being taken to speed deployment and provide internet for all Americans, the joint use community is being impacted. As the nation changes, joint use departments should prepare for a high-volume of attachment requests, permitting paperwork, insurance requirement paperwork, billing and invoicing, OTMR documents, and much more. Joint use owners are scurrying to ensure that their asset data is current and accurate. Several asset owners and attaching companies are exploring new, intuitive ways to prepare their departments for upcoming deployments. Spreadsheets and the use of multiple systems are being left behind. Joint use departments across the nation are switching to a system that works for their data and business processes. Many companies are using a joint use platform that provides communication between external partners and internal departments. In fact, 39 states across the US are currently using the platform. The platform assists in managing new and existing asset data with workflows, dashboards, and mapping features. If you would like assistance managing fiber deployment or if you would like more information on a joint use platform, contact Alden to speak with a product management specialist. We are happy to provide a consultation to discuss how a joint use management system may help your company. How is your company managing fiber deployment? What preparations do you have in place to ensure clarity over your assets in the future? Let’s create a conversation about current joint use management trends in the comments below.